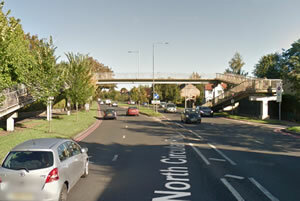 The North Circular was closed on Sunday afternoon (25 October) after a woman fell from the footbridge near the entrance to Gunnersbury Park. Police were called to the scene at 4.53pm along with London Ambulance Service. The woman was treated at the scene but there is no information about her condition at this stage. The A406 was closed both ways between Chiswick Roundabout and the Uxbridge Road for over an hour leading to substantial delays in the area. Acton High Street had been closed earlier in the day due to emergency sewer repairs by Thames Water.